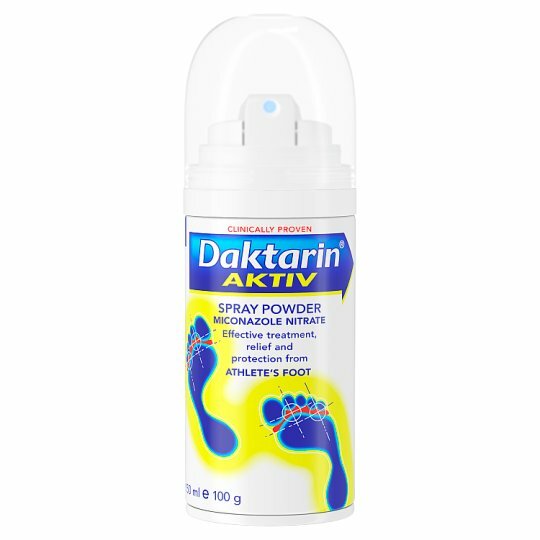 Daktarin Aktiv Spray Powder contains miconazole nitrate. This is an 'antifugal' for treatment, relief and protection against athlete's foot. How to use: Wash the affected area and dry it well. Shake the can well. Hold the can 3 inches from your skin and generously spray the affected area. You can also spray inside your socks and shoes. Treatment: Use twice a day until your affected areas of skin look normal. Protection: Regular use helps protect from reinfection.